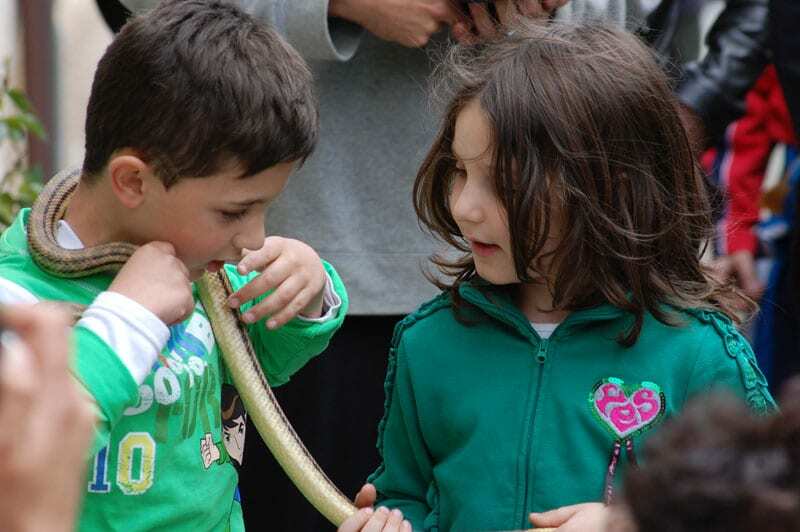 Cocullo’s snake festival held on the 1st May in celebration of Saint Domenico must win awards for being not just one of Italy’s strangest festivals, but also for being the most multi-cultural. 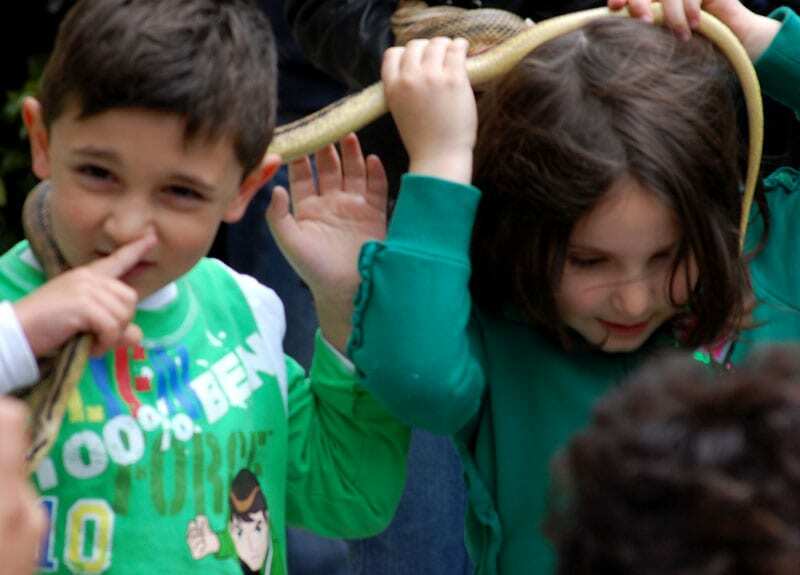 The attraction of snakes seems to be a huge pull factor, and seemingly the whole world’s major ophidiophiliacs (snake-lovers) often accompanied by their snakes, alongside keen photographers, descend on the small medieval town of Cocullo, 900 masl in the Abruzzo Majella Mountains, ready to take part in this festival which has been re-enacted in its current Christian format each year, apart from 2009. 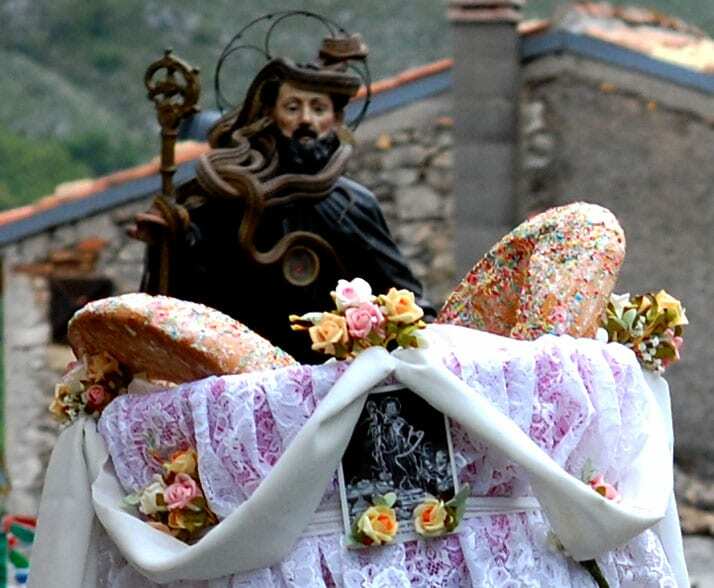 There are three supposed origins to the Cocullo Snake Festival… In the C11th apparently Saint Dominic cleared the local fields which were being overrun by snakes, and as a sign of thanks since 1392 the locals parade his statue and snakes around the streets. The second version dates to 700bc…. 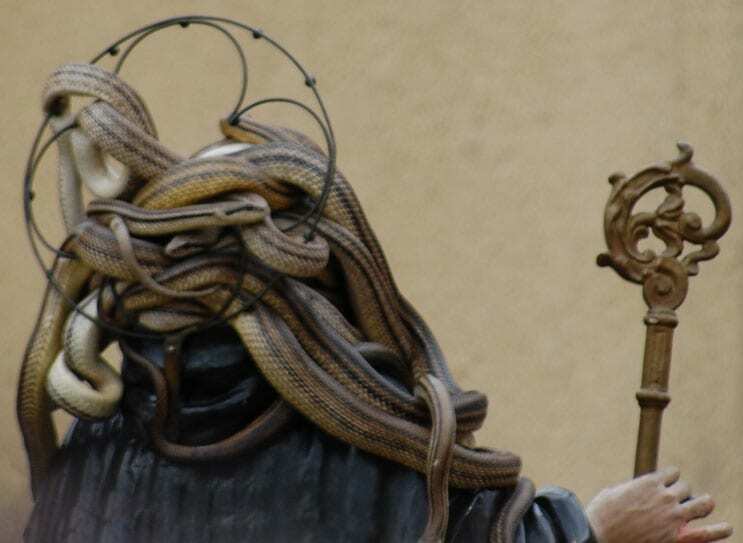 locals experienced the same problems in tending to their fields and Apollo ordered the village to entwine the snakes around his statue so that they would become tame and be able to farm once more. The first origin dates back some 3000 years to the Marsi who were the original inhabitants of the area who worshipped the Goddess Angizia. This goddess’s official symbol was a snake and thus offerings of snakes were presented to her to fend off attacks from local wolves, bears and malaria. Following an early morning Mass in the town’s small church, local inhabitants ring a small bell using their own teeth to protect them against toothache for the following year. Local soil is blessed which afterwards is spread over the local fields to act as a form of natural pesticide. 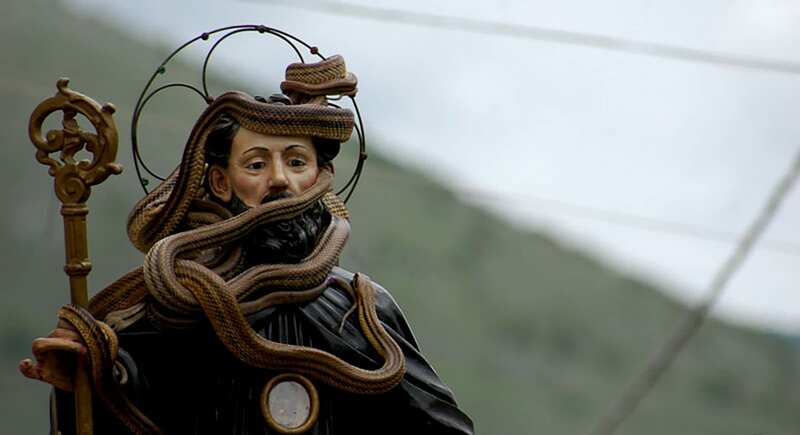 The wooden statue of Saint Domenico is then taken out of the small church and the serpari drape their found snakes over the statue and his jewel encrusted gold frame ready to be paraded around the narrow lanes of ancient Cocullo. Leading from the front are the brass band, that ironically seems to be mostly composed of those most snake charmer-esque of instruments, the oboe & clarinets. Another Mass is broadcast over loud-speakers, which women traditionally dressed recite & sing, followed by somber priests. They are followed by girls in traditional laced costumes carrying ciambelli which are local cakes that have a texture like doughnuts and are decorated with pastel coloured hundreds & thousands. Saint Dominic carries up the behind, his tamed snakes still entwined and their charmers following closely behind. The procession winds back down to the church where it all started, and on their arrival home, a huge banging fireworks display which sounds more like cannon shots begins its 10-minute overture. If you love something out of the ordinary that gels pagan & Christian rites do visit Cocullo’s snake festival; your next door neighbour may be stroking their snake next to you, but hey it gives you something to talk about as you gasp and think of a reason to decline their generous offer of holding their snake whilst jostling to get that ultimate photograph. Get here really early, the procession begins at 12.00 noon and the parade lasts for approximately 1 hr 30 minutes, the problem is parking… you can end up if you arrive late parking your car up to 4 km hike uphill from the depths of the Sagitarrio Valley to get back to the small town of Cocullo severely out of breath if you are unfit. You may hate the huge numbers of porchetta vans and mini market stalls up to the town itself and wonder why the police don’t allow people to park there, but due to the huge numbers of people that attend the Cocullo Snake Festival, food must be had by attendees. Local restaurants get booked out with celebrating locals so our suggestions is to go down the porchetta Panini route. The writer of this post gotta be from Pittsburgh. Who else says “slippy”? I was in Cocullo but never was able to see this ancient Festival ! Would loved to see it with the THOUSANDS of people who attend !! LOVE ALL ABRUZZO !!! It’s amazing despite the crowds! Life in Abruzzo I will in Abruzzo from May 18th to May 27 ! LOVE ABRUZZO !! 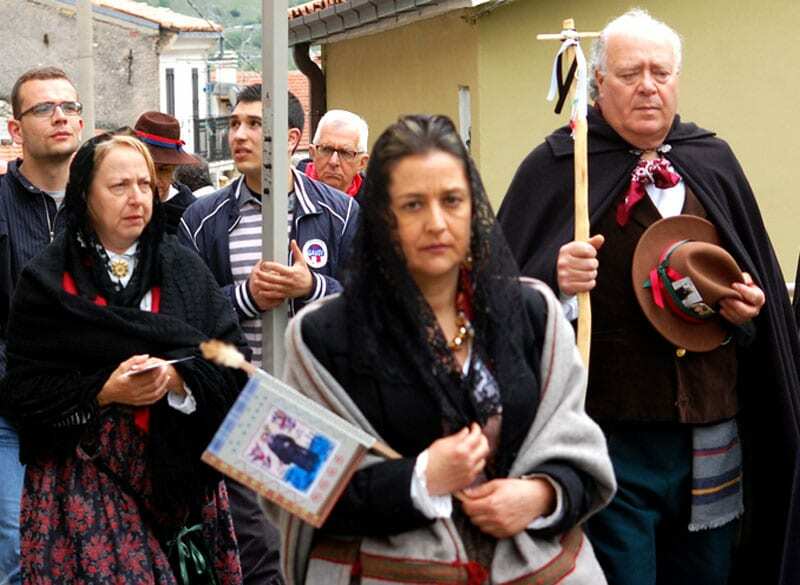 I was in Cocullo touring Abruzzo but never attended the May 1st Festival of St. Dominic . Maybe some day ? It’s a great reason to come back, I think it’s one the most interesting historically and visually unique! Yes ! We Loved Cocullo . My father was born and raised in Scoppito near L’Aquila . I hope to return and see the Festival of St Dominico some day !! !